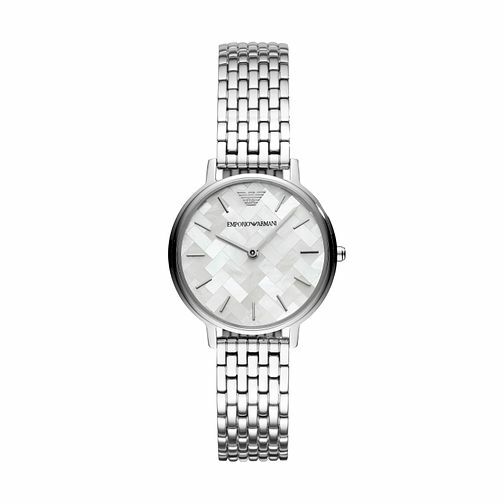 Upgrade your style with this watch by Emporio Armani, featuring a cool stainless steel case and a dial that features a beautifully symmetrical mother of pearl textured pattern. The watch is finished with a slim bracelet for a more sophisticated sense of style. Emporio Armani Ladies' Mother of Pearl Bracelet Watch is rated 5.0 out of 5 by 2. Rated 5 out of 5 by Anonymous from This product has was perfect The watch was a perfect present for my girlfriend. Perfect size, look, weight etc. Good price as well, found it for £40 less than other sites.